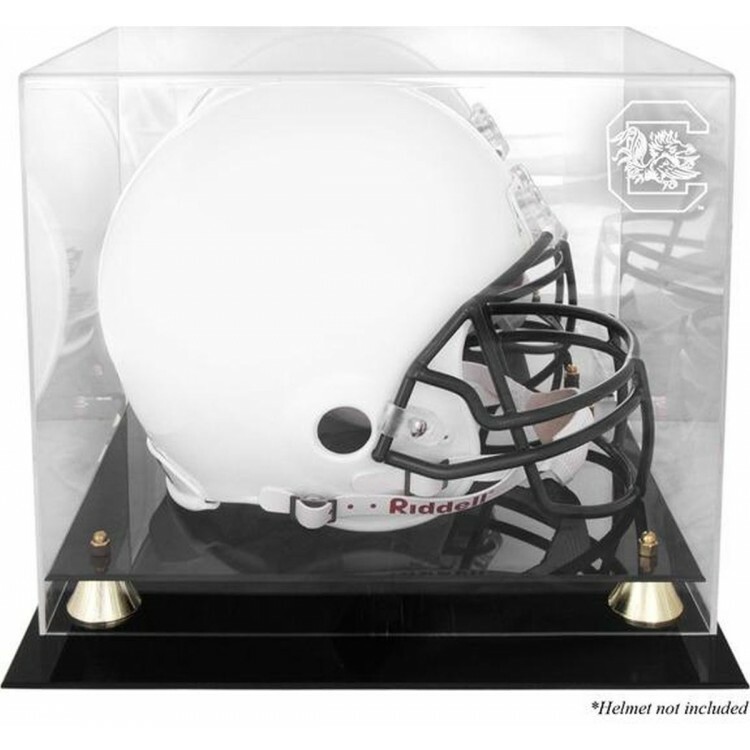 The South Carolina Golden Classic helmet display case comes with a black acrylic base and gold colored risers. It is made of 1/8"-thick acrylic and features a clear acrylic removable lid with engraved team logo. It also comes with a mirrored back. The case is perfect for a collectible helmet. It is officially licensed by the CLC and the University of South Carolina. Inner measurements: 13 3/4" x 10 1/2" x 10 3/4". Outer dimensions: 14 1/2" x 12 1/2" x 12". Memorabilia sold separately. This collectible contains a 16x20 photo of Kyle Busch, as well as a double-matted banner depicting h..
North Carolina 15" x 26" Basketball Mirror by Holland Bar Stool Company.. The New England Patriots wall-mountable mini helmet logo display case is made of 1/8'' thick acrylic..
You're up to Bat with our famous wall mountable bat cases! Bat fits only in the direction shown. Mea.. The Goalsetter Basketball Pub Table is the perfect addition to your sports den or family game room. .. The Museum Edition Single Baseball display features an all clear archival design with a 3/8" thick c..
Machine-Made Tufted. 100% Premium Nylon Pile. Made in the USA! Virginia Tech 5'4"x7'8" College Repea.. Display your favorite autographed baseballs in this ultimate, MLB licensed 4 baseball case with gold.. This San Francisco 49ers Riddell replica helmet has been personally hand-signed by wide receiver Mic..
Machine-Made Tufted. 100% Premium Nylon Pile. Made in the USA! Southern Methodist 10'9"x13'2" Colleg..